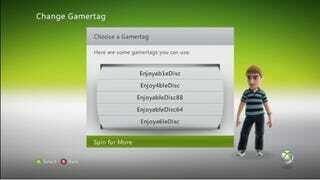 Some gamers need help with creating their Xbox Live gamertag. The new fall update is here to help. It provides a more user friendly way of doing it: spinning a wheel. But its suggestions? They need work. The first two times, I spun the wheel, I got a good array of names. Then the third time, it gave me a variation on "EnjoyableDisc". Every single time after that! Whether it was "Enj0yableDisc" or "Enjoyabl4Disc" or "EnjoyableDisc59", there it was. It's the default. No Microsoft, I do not want to be EnjoyableDisc. And neither should anyone else. But "BluberryDragoon"? Now we're talking.